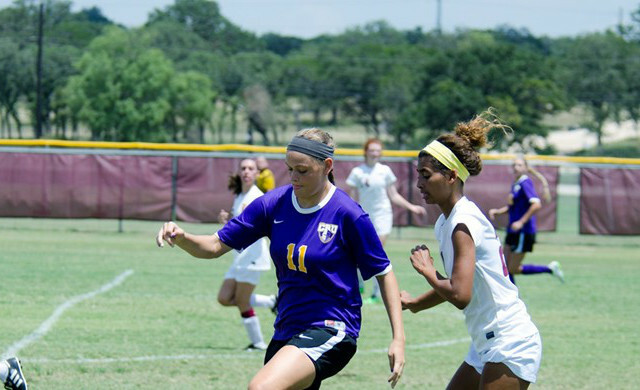 BELTON – The University of Mary Hardin-Baylor women’s soccer team beat the University of Texas at Dallas 3-0 Saturday evening in Belton. The win improved the Cru to 9-4-2 on the season and 6-1-2 in American Southwest Conference action while the Comets fell to 12-4-1 on the season and 6-2-1 in conference play. Kathryn Parker scored first for the Cru, finishing a through ball off an assist from Sarah Rempe in the 16th minute. Rempe recorded another assist when Cameron Shivers found the back of the net in the 37th minute, giving the Cru a 2-0 lead at the half. UMHB held that lead until just over 20 seconds left in the contest when Parker beat the goalkeeper in a one-on-one and netted the Cru’s third goal. Parker, Rempe and Shivers each led the Cru with two shots while Kristen Hoelscher and Briana Hester each added one. UMHB totaled eight shots and gave up just nine to the Comets. Courtney Craig earned the win in the net, making four saves in the shutout. Macaire Ament took the loss for the Comets, giving up three goals and making two saves. UMHB returns to action next week in the American Southwest Conference Championship Tournament, November 6th through 9th hosted by Hardin-Simmons University in Abilene.